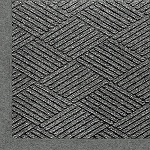 The Andersen WaterHog Eco Premier Fashion Entrance Mat combines the performance features of a diamond face pattern and adds an attractive fabric border to make it a great addition to commercial areas and offices. 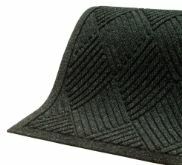 Made of recycled PET polyester, this floor mat creates a system of fibers that traps debris, and keeps it off the floor. Plus, a nubbed surface helps to trap and remove dirt as people walk along the matting. Great for areas that experience high traffic, the Eco Premier Fashion mat is designed with reinforced nubs that aid in maintaining its performance for many years to come. This is the heaviest Water Hog product made by Andersen, and yet is it very easy to clean. Just vacuum daily, or hose the Eco Premier Fashion matting and then hang it to dry.